Assess the performance of your booth staff. See how many leads were captured and check their quality. 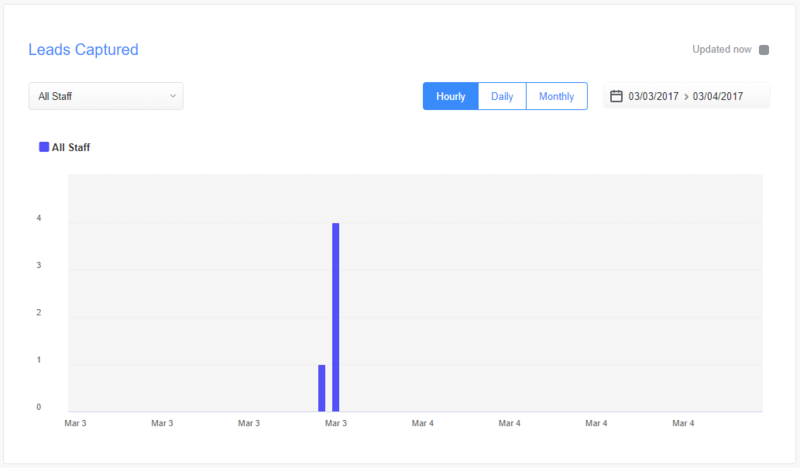 Allows you to see how many leads were captured in total and the overall number of gathered insights, insights per lead value, average lead quality. 2. Bar Chart of Leads Captured. See how many leads were captured by each staff member individually. View hourly, daily, and monthly capturing stats. Set up the chart to show a particular date/time range. Descending statistics reflecting the number of leads captured by each staff member. A chart giving you an overview of the captured leads quality percentage wise. Each slice in the chart represents the percent of leads of a particular quality (from 0 to 5) in relation to the whole number of leads. An overview of your leads social activity (messages, likes, comments, etc. ).